The great 19th century painter and naturalist John James Audubon knew the difference between striving for something and getting an image just right. Audubon routinely worked from dead specimens but understood the importance of capturing the subtle details of life in his paintings. Take some time leafing through Ocean Fishes, and you’ll immediately realize that Prosek invested much time and effort to nail down those very details. The Ocean Fishes project began when Prosek was a Yale University undergraduate and it announced his scope and ambition both as an artist and a natural historian. Prosek is also an experimentalist: phosphorescent effects were often called for when rendering fish scales, so he developed a way of working ground mica into the paint to help achieve them. The final result is a volume of faithfully reproduced images (along with accompanying scale indicators since all the fish, from a 14” porgy to a 12’8” blue marlin, were painted life-sized) that is both a reference guide as well as an art book that can find a home in any fishing library or on a coffee table. If you’re searching for gift possibilities for the upcoming holiday season, Ocean Fishes is a no-brainer. 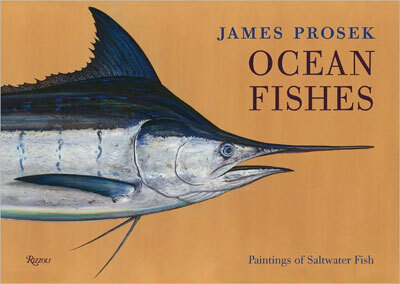 Buy “Ocean Fishes: Paintings of Saltwater Gamefish” in the MidCurrent Store.